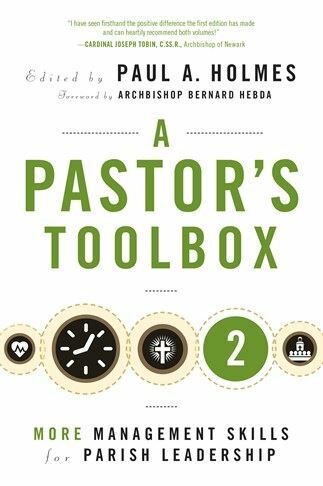 The remarkable success of the book A Pastor's Toolbox: Management Skills for Parish Leadership has demonstrated that the demands of time and financial challenges continue to impact the work of today's parish leaders. The need has become even greater for practical tools to assist in the many aspects of temporal administration, leadership, and church management. tools for parish stewardship, communications, and Catholic schools. The book is an outgrowth of the Toolbox for Pastoral Management, a nationally recognized joint project of Leadership Roundtable and Seton Hall University. Learn more at www.LeadershipRoundtable.org. Reverend Paul A. Holmes, STD, is distinguished university professor of Servant Leadership at Seton Hall University, where he has taught moral and sacramental theology since 1988 and served as vice president for nine years. For many years, he served as spiritual director for the Clergy Consultation and Treatment Service at St. Vincent's Hospital in Harrison, New York. The first volume of A Pastor's Toolbox was received with gratitude and enthusiasm by priests and bishops across the country. This second can, indeed, help any new pastor as he approaches the management of his parish. As a companion to the first, new and seasoned pastors have the answers to so many questions regarding parochial leadership. I have seen firsthand the positive difference the first edition has made and can heartily recommend both volumes! Once again the Leadership Roundtable has produced a resource guide for those involved in church/parish management. Like the first volume, this work continues to build upon the foundation of that workshop. Offering guidance and direction that benefits a priest administrator daily in his ministry, it is a book that should be gifted to every new pastor-if not every newly ordained priest. A Pastor's Toolbox 2 is an invaluable resource and a welcome addition to any parish library!